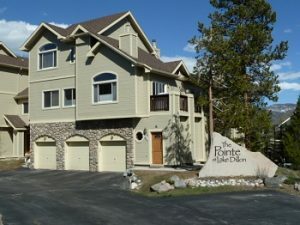 Pointe at Lake Dillon is located steps from Lake Dillon in Frisco CO Real Estate. The townhomes are also moments from the bike path that runs from Breckenridge through Frisco where you have the option to continue on to Dillon and Keystone or go the opposite direction to Copper Mountain and Vail. Built in 1996 – 2000 there are a total of 24 units in the Pointe at Lake Dillon complex. There are 14 – two bedrooms and 10 – three bedrooms ranging in size from 1217 – 2010 square feet. Each residence has either a 1 or 2 car attached garage as well. Being located in Frisco, Colorado off of the Dillon Dam road makes Pointe at Lake Dillon centrally located in Summit County. Since the property is located in Frisco there is a 1% transfer tax, this is a one time fee that is paid when a property changes hands. Pointe at Lake Dillon is the place to own if you want to have fabulous views across Lake Dillon and onto the mountains that seem to rise right out of the lake. When looking to purchase Frisco Colorado Real Estate take a look at what is for sale in Pointe at Lake Dillon. To arrange a showing of Pointe at Lake Dillon or other condos for sale in Frisco CO Real Estate, contact Justin and Krystal Knott with LIV Sotheby’s International Realty.